A device ID has been used that is out of range for your system. Sound will be disconnected. Click the cog up in the top right and select Options, you should then get this window. 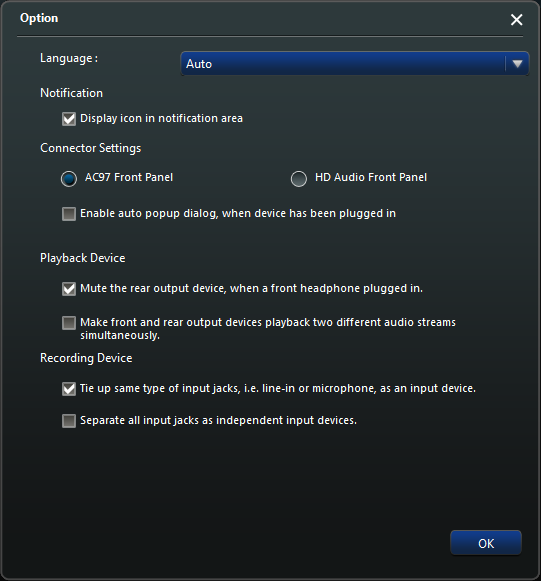 Clicking the 'AC97 Front Panel' option will disable the jack detection. 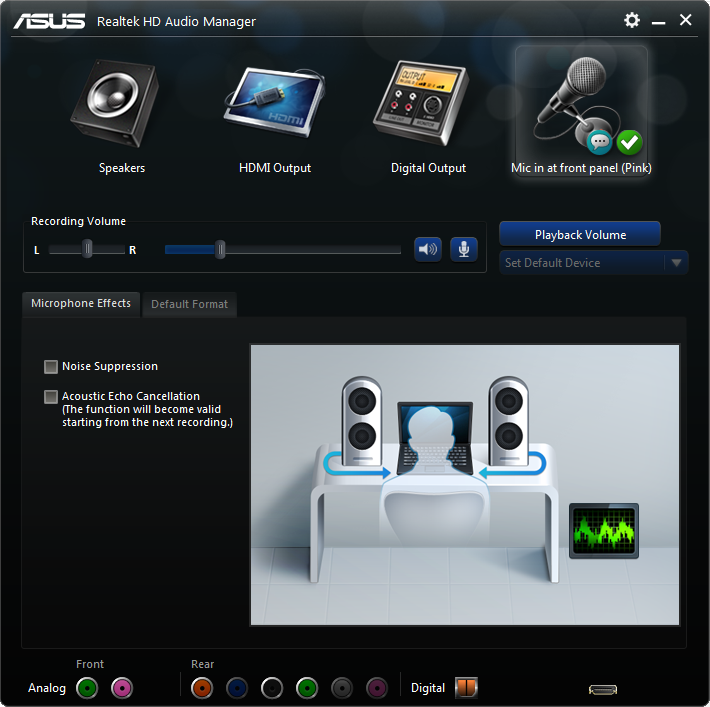 After that the next time you boot up a VM you should find the sound is working once more. Version 5.0 released!!! . . . . finally. Yep it's finally here, after months of waiting I have finally finished up this release. Judging by the amount of downloads and traffic my older releases still generate I reckon there a quite a few people still using the Novo 8, there's lots to talk about so lets get started. First up the most important change is that this release makes use of the Aroma installer, this allows you to customise the installation to a certain degree. 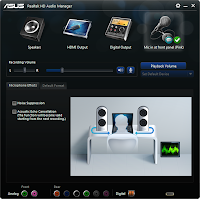 Among those choices are the ability to change the boot image, boot animation, status bar size and certain optional apps. All the various apps are the latest as of the upload and have been checked that they all work so hopefully no duff apps this time round. Smaller Statusbar with optional no Softkeys. There's an absolute shedload of stuff packed into the rom, I actually had to take a couple of minor bits out as it got to big for the installer to handle. A quick list of what's present. All the regular Google apps updated the the latest where possible: Play Store, Gmail, Google+, YouTube, Maps, Earth, Play Books, Play Music, Currents, Play Games, Hangouts, Play Services, Translate. Latest Firefox and Dolphin browsers. 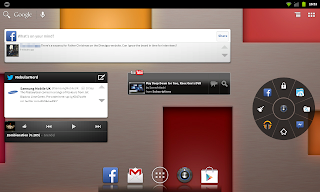 Optional Dropbox and Google Drive apps. Floating Toucher (free) for quick access to your favorite items. 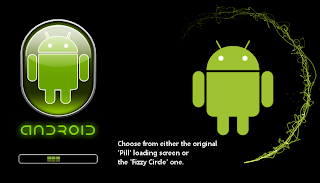 Titanium Backup, SD Maid and other small apps from previous releases. Latest Facebook, Facebook Messenger, Twitter, Skype. Adblock and Droidwall to help prevent unwanted ads and such. New Chainfire SuperSU for handling root apps. And a few more updates and tweaks. Installing this rom is a little different than normal as you have to choose a few options on the way through but otherwise it's the same process as before of copying the contents of the zip to you card. It's a big firmware at over 300mb so the install will take a while and the first boot will take ages so go and have a cup of tea while it works everything out. ADW will give you two popups to welcome you to the launcher, either follow them through or dismiss them by pressing the HOME button. If installed AdBlock will ask for root access which you will need to grant for it to work. 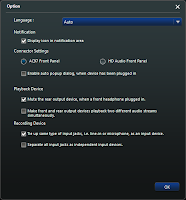 If installed Hangouts will complain about Google Services being needed, this is installed through a script during the first boot and needs the Novo to be rebooted to clear the message. Once everything has finished popping up reboot the tablet otherwise certain things like ES File Explorer and Titanium Backup's root abilities will not work. V5 is now getting somewhere, the Aroma installer is letting me do all sorts of things but more importantly . . . The STATUS BAR is no longer so HUGE!!!! Check out the screen shot below. Amazingly it was an easy fix but due to it being a very odd issue it took me ages to find out what I needed to do. 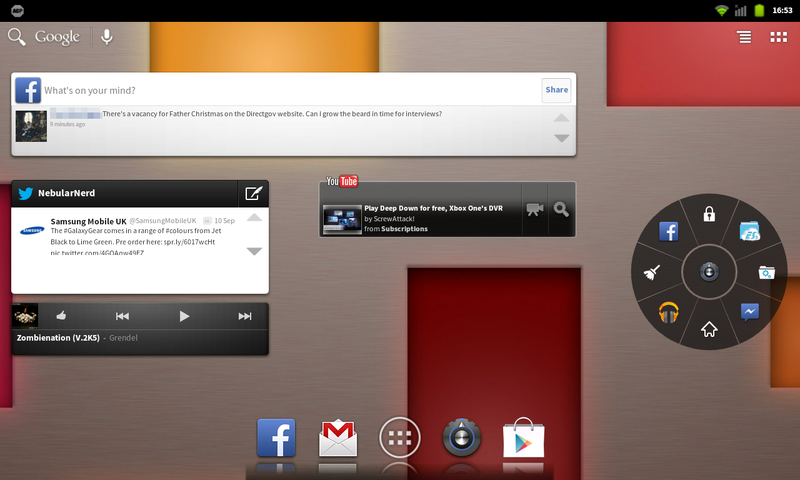 As you can see the icons are smaller and the bar is not much larger than the wi-fi and battery icons. I shall offer both the original and smaller size version as choices in the new rom. 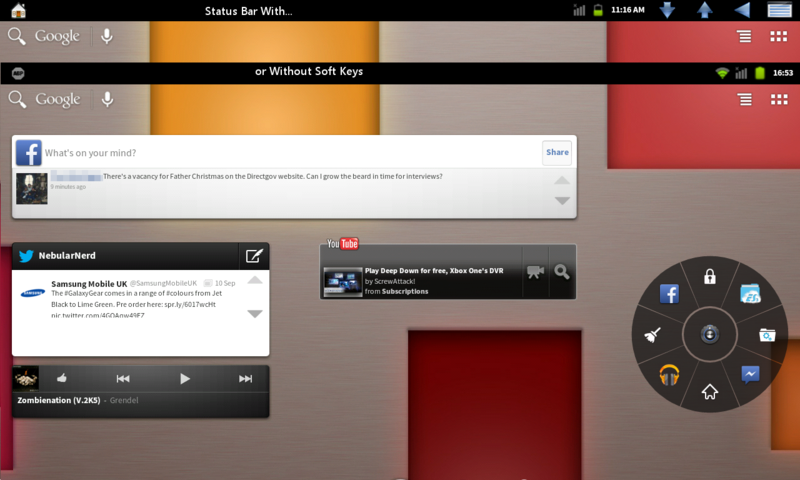 My next trick will be to try and get rid of the soft keys on the status bar which will tidy the status bar up nicely. Status bar icons are gone, I shall offer the choice of having them or not in case anyone out there needs to make use of them. 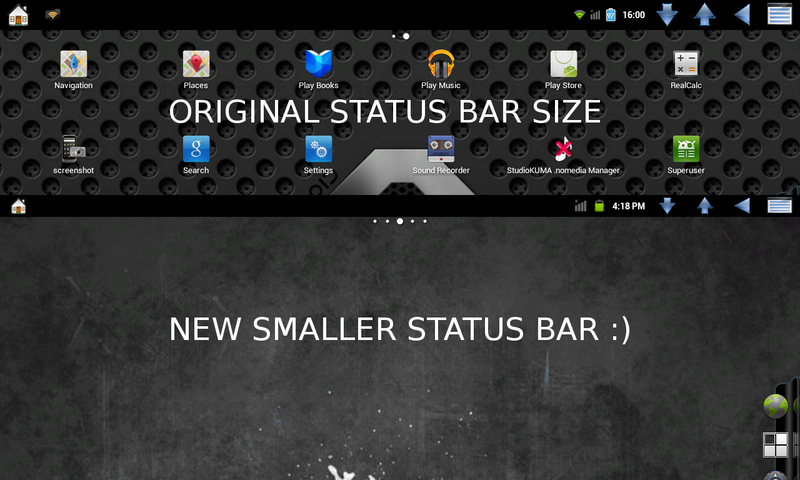 This will give the the choices of big/little status bar with/without icons. 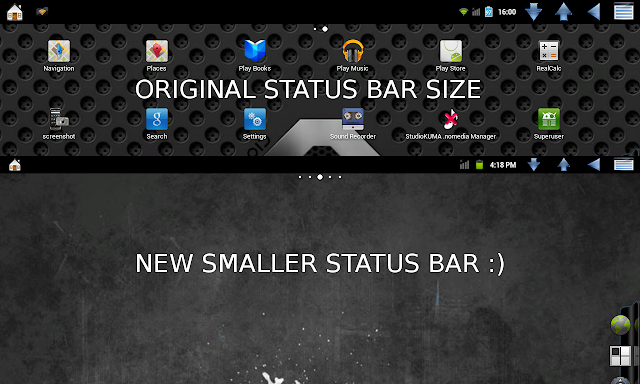 No more icons, an uncluttered status bar. Choice of Dolphin or Firefox Nightly (or both) Internet Browsers, I have been using Firefox heavily and it's a great browser. Dolphin will include some extra plugin choices but Firefox may not be able to have that due to the way it handles plugins. Boot animation choices, there have been a couple of different animations throughout my releases this will give you a few choices to pick from. Boot logo choices, this is the first screen you see when the Novo powers on. There will be a couple of choices for this. Launcher choices, this will be between the current ADW and GoLauncherHD. GoHD has some nice features and is great for tablets but it's lacking some of the nicer features the regular GoLauncher has but I quite like it. It will work on any of the current releases so you can go and try and see what you think. 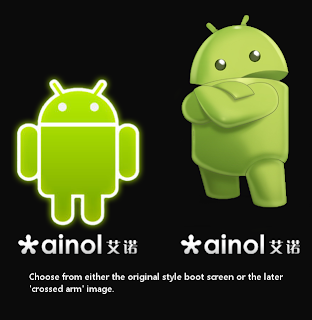 Additional Keyboards, there are some nice ones out there now and I can give the option of Baidu for those that want to use it. Other choices for apps that may not be used by everyone, Google Play, Books, Earth, Skype for example. If you have a suggestion for an app you would like to see or have a choice of changing use the comments below to let me know. This is going to require a lot of testing and I have other things I want to try and achieve as well so there will be a wait but it will be worth it.